A data recovery software that’s the most advanced and still the easiest…sounds unreal? 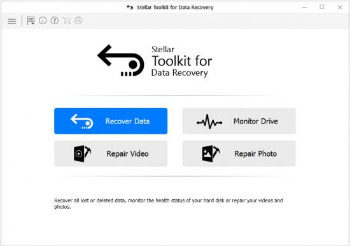 Unveiling the all-new Stellar Toolkit for Data Recovery — a software that truly pairs the potential of a simple DIY interface with innovative data recovery. Permanently deleted files, corrupt or formatted hard drives, inaccessible volumes and what not…Stellar Data Recovery Premium gets back all the lost data and now also repairs corrupt Videos and Photos! Why it’s the most-preferred data recovery software? • Drive monitoring, disk cloning, disk imaging. Does it all. Need to do a lengthy data recovery but don’t have the time for it to finish? Save the scan file and load it anytime later into the software to resume the data recovery process. The Scan and Load Scan Information feature saves time and facilitates data recovery with convenience- at your own pace and as you like it. Data loss scenarios can be both unique and common to Windows and Mac users. For instance, a Mac user may lose data due to a corrupt BootCamp partition or Time Machine backup, while a Windows user may’ve lost data due to a system update issue. Data loss due to an inaccessible volume, in turn, can be troublesome to both. You don’t ever need to worry about such situations if the Stellar data recovery software is by your side! Now, also supports data recovery from macOS Mojave. Unlike other products in the market that fails or crash while recovering data from encrypted disks, the Stellar Toolkit for Data Recovery recovers data from a password-protected storage drive with a few clicks. Recovery from an encrypted hard drive and storage media requires the password that must be entered when prompted – before the recovery process starts. The toolkit has an option to create a ‘Disk Image’, which is a mirror image of any storage device from which you want to recover data such as Internal or external disks, volumes, USB drives, SD cards, etc. The disk image is saved as an IMG file where recovery can be performed. This option allows you to recover data from a hard drive with bad sectors. Additionally, you can specify the ‘Starting’ & ‘Ending’ sectors on the storage device to create an image of the selected region on the hard drive instead of entire drive. It supports data recovery from different storage devices such as SSDs, hard drives, SD cards (Mini SD, micro SD, SDHC/SDXC card) and from missing, unmounted, or corrupt Linux, Mac, & Windows based volumes. Simply connect the external storage, launch the software, run a scan, and save recovered files at the desired location. The toolkit provides an innovative option that builds a Virtual RAID construction when RAID reconstruction fails due to incorrect RAID parameters or other similar reasons. The Virtual RAID facilitates ‘RAW Recovery’ as well as ‘Search Lost Volume’ operation to recover the lost data from the corrupt or inaccessible RAID. The newly included SMART Drive Monitor utility in the software keeps proactive check on several vital attributes of the hard drive to prevent data loss due to drive failure. The Scan Disk locates bad sectors on the drive to determine its tolerance and readiness to withstand a routine data recovery process. Otherwise, the Clone Disk feature allows to create a replica of the drive for data recovery, and thereby prevent permanent data loss situations that may arrive due to drive failure. The add-on video repair feature fixes corruption in virtually all types of video file formats. It’s the one video repair tool that you would ever need to restore corrupt videos irrespective of the device— digital camera, DSLR, drone, smartphones etc. — that was used to record them. Besides, the software works effectively across the entire video production cycle including video recording, media transfer, video editing, video conversion, or any other type of video. With Stellar Toolkit for Data Recovery, lost or deleted files can be previewed before saving. This helps in precise data recovery. After the scan, the software classifies all files in a Tree View, File Type, and Deleted List. Click on any file to preview it. This feature can be manually turned on/off by the user. When the ‘Quick Scan’ is not able to find the desired data, the ‘Deep Scan’ option helps to recover data by thoroughly scanning each and every bit of lost or deleted data from the storage drives & volumes. It searches data based on ‘File Signatures’ and facilitates RAW data recovery which is helpful in case of a severely corrupt volume. The toolkit provides an ‘Advanced Settings’ option to compress & save recovered files at your desired location. You can either choose to compress each recovered file individually or save all the recovered files into one single compressed file. Further, you can choose to exclude, include, or recover only ‘Deleted Files & Folders’ and specify file filter while saving the selected data. Select only those file types that you want to recover from the storage drive, before starting the scan process. This facilitates faster scanning as the toolkit searches only for the specified type of files. There are various file types that are already listed in the ‘File List’ option. You can select the required file formats from the list for their recovery. Try out the add-on photo repair utility to restore corrupt, damaged, and broken image files in pristine condition. The software fixes the photos taken with any major camera brand in a variety of file formats such as JPEG and TIFF. It also repairs RAW camera image files stored in USB stick, SD card, SDXC, SDHC, or any other external storage compatible with Windows. It can simultaneously repair several files of different types, with option to preview them before saving. Even the severely corrupt files – which are otherwise beyond the scope of repair – can be redeemed in the form of thumbnails.